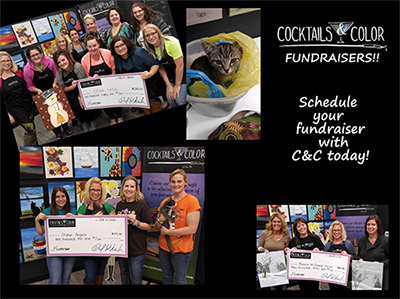 We have done hundreds of fundraisers at Cocktails & Color over the past 5 years and we’ve definitely learned some things about how to make them successful. Not all fundraising efforts need to be grand affairs- oftentimes, individuals and organizations alike need some quick fundraising ideas to get the ball rolling on a longer-term campaign, or there may be an emergency situation where funds are needed quickly. Candle sales, food sales, organized races, bingo and purse parties are all great ideas when it comes to raising money for your organization. We offer painting parties where a portion of the proceeds are given directly to the organization after the event. Any event where you can get your family, friends and supporters involved and having fun is sure to be a success! Once you have a fundraiser planned it’s time to start promoting it. In this day and age social media is the least expensive and fastest way to get the word out. Create an Event Page on Facebook with all the details and a link for people to go to so they can sign up for the event. Make sure you include an eye catching photo. Once the Event Page has been created click the “invite friends” button and invite anyone that you think may be interested. Let people know that even if they are not able to attend it would be helpful if they would click on the “interested” button and share with their friends. That helps the Event Page get seen by more people. Does the non-profit you are raising money for have a Facebook page? Contact them and explain what you are doing and ask if they would share the event on their Facebook page with their supporters as well. If they are willing they could even “co-host” on the Event Page on Facebook and then they could personally invite all their friends and supporters too. Offering Chinese auction items or items that could be raffled during the event is a great way to raise additional funds. Depending on the type of event a bake sale could be a good addition as well. At Cocktails & Color our painting fundraisers are $40 a person with $10 from each seat going to the organization (for parties of 20 or more painters). The person organizing the fundraiser can choose from any of our paintings as well as the day and time of the event. Our studio is BYOB and painters are welcome to bring any food and drinks that they would like. For more information you can check out our Fundraiser Info page.